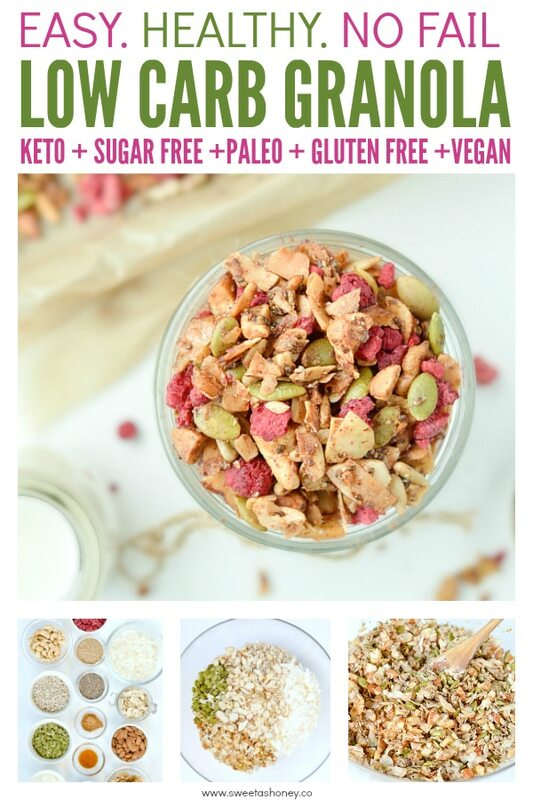 How to make Grain Free Sugar Free Granola ? 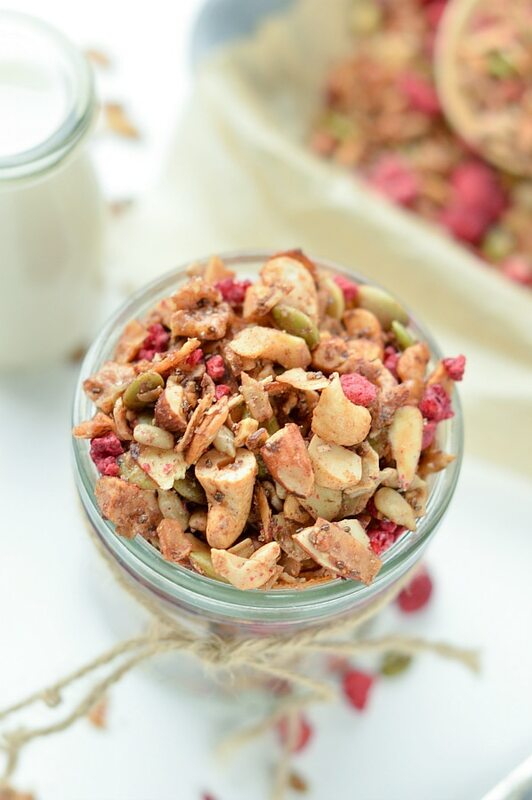 It is pretty easy to make a delicious crunchy granola without grain or sugar. The key is to use a combo of those 6 main ingredients. Seeds – seeds are also a great way to add smaller crunch pieces into your granola. I love to use pumpkin seed, sunflower seed and chia seed. Spices – the spices are the best way to add extra sweet flavor without using sugar. I love cinnamon, a bit of salt and vanilla. Of course you can also add grated agrumes zest (orange is delicious), ginger, nutmeg or unsweetened cocoa ! Play with the spices to make a delicious new recipe each time. Oil – I am using extra virgin coconut oil to roast my granola. I love the tiny coconut flavor it adds into the mixture plus coconut oil is a very healthy oil full of anti fungal and anti bacterial properties. If you don’t like coconut flavor replace by refined coconut oil – it won’t have any coconut flavor! 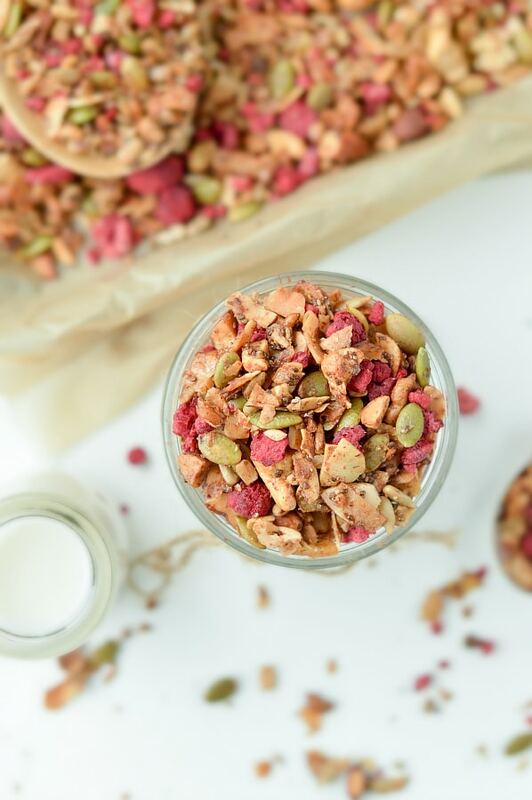 Dried fruits – as I love to keep my granola sugar free I choose dried freeze raspberries It is basically dried raspberries with no added sugar. Of course it is optional but it add a delicious fruit flavor to your cereals. If you prefer dried fruits, use the one that contains few natural sugar like goji berries or dried apricot (as a lower GI index than dates for example !) or unsweetened cranberries. Sugar free sweetener – good news ! 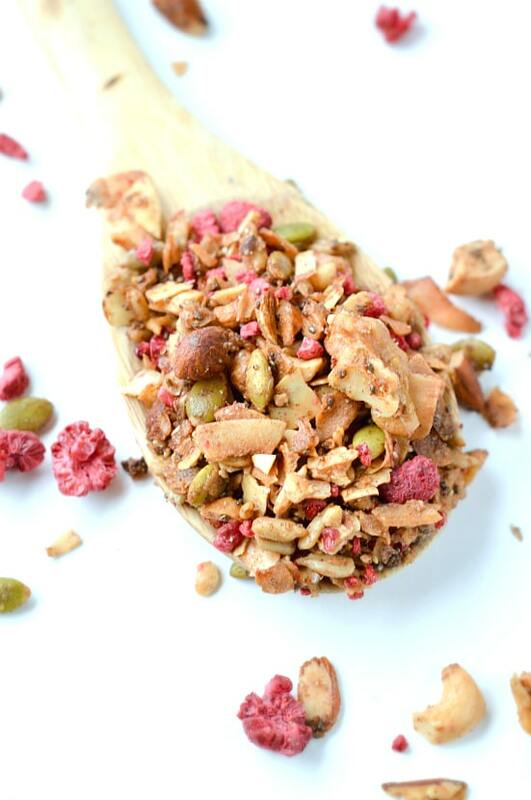 you DON’T need a sweetener in your grain free sugar free granola recipe ! Specially if you intend to eat yours in a breakfast milk bowl, I would recommend to add the sugar free crystal sweetener directly into your bowl – not in the cereal making. Why is it healthy ? 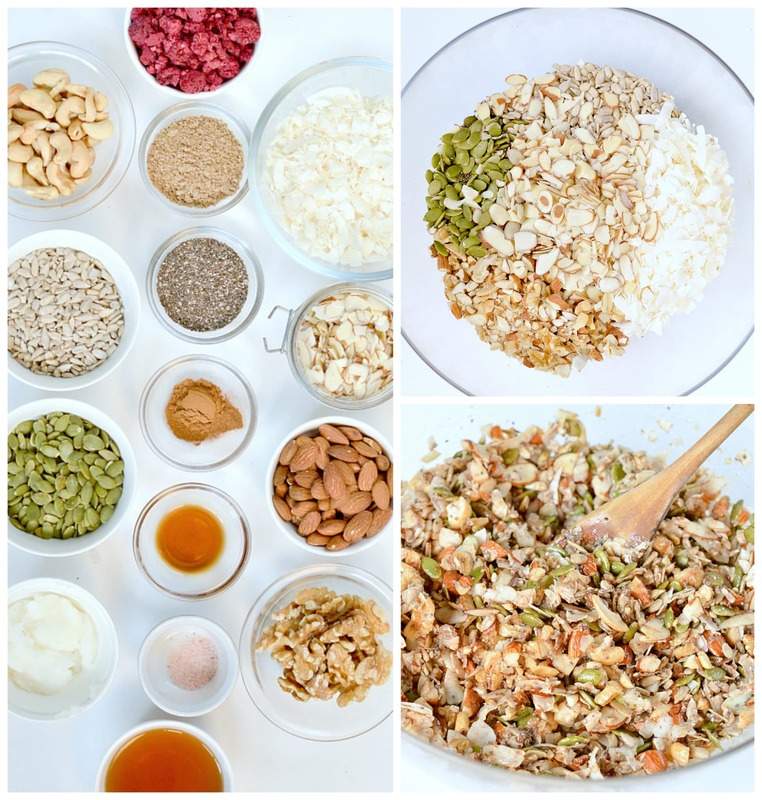 A grain free granola is an healthy way to boost your body with protein, hearty-healthy fat – monounsaturated and polyunsaturated fats and Omega-3. Nuts are also very fulfilling, low carb and high in fibre to keep your guts happy ! and Make sure you roast the nuts at a maximum of 150C (300F) to keep those nutritional properties intact. Of course, it taste better if you use some sugar free sweetener into this recipe, particularly if you eat this granola on top of plain yogurt or into a parfait. So those are my sugar free recommendation. I love natural Maple-Flavored sugar free sweetener made of Monk fruit. Monk fruit is a sugar free natural sweetener that contains ZERO carbs, sugar or calories! That is better than stevia or erythritol as it is liquid and coat your granola perfectly. If you prefer to use sugar free crystal sweetener like swerve or erythritol that is ok too. See more details in the recipe card below. Not sugar free? if you are paleo or vegan and love some natural sweetener this recipe works with any other liquid sweetener like brown rice syrup or maple syrup. 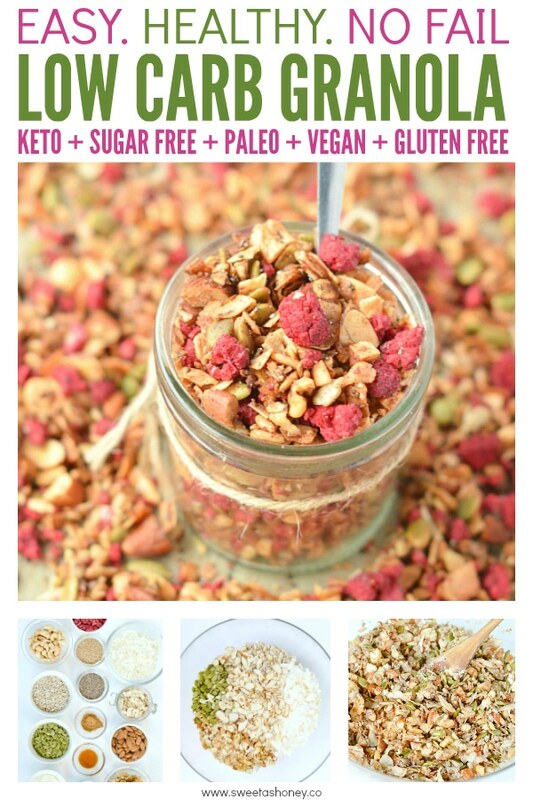 How to store your sugar free granola ? I recommend to wait until fully cool down before transferring your homemade sugar free granola into a jar. My favorite jar are glass parfait jar. They are airtight jar that keep the granola crunchy up to 2 weeks. I always store mine at room temperature in the pantry. The fridge will soften your granola. Also, don’t freeze your granola ! Sugar free breakfast, snack or dessert ! This is a versatile recipe. I found this recipe AMAZING to fix my sugar craving anytime in the day without eating much carbs. I love to use it for breakfast as a snack or dessert. 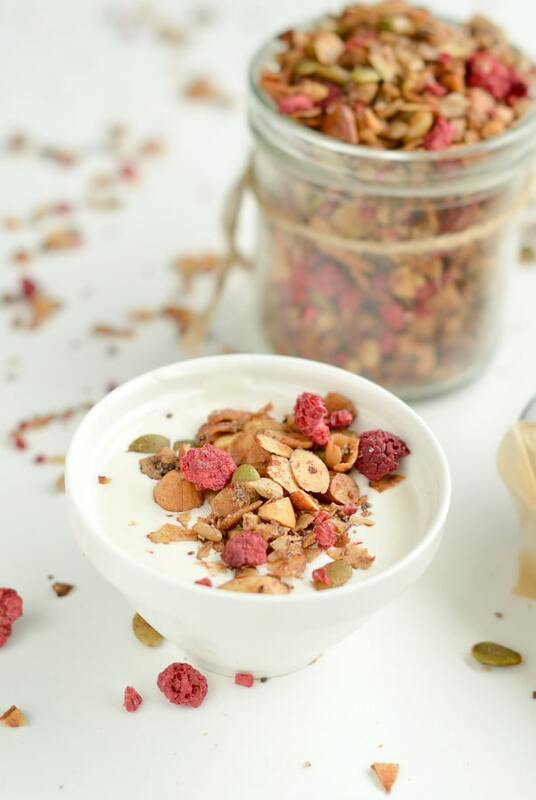 Breakfast – serve 1/4 cup of grain free granola with 1/2 cup almond milk into a bowl. Dessert – I love to sprinkle some on top of my yogurt or my ground chia seed pudding to add some crunch ! 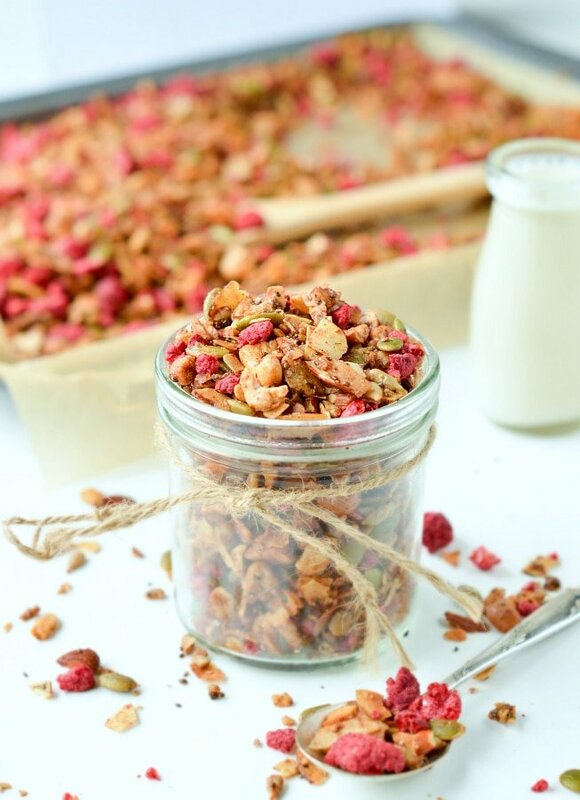 Enjoy this simple grain free sugar free granola recipe and leave me a comment if you make it ! Watch the recipe video and make your homemade grain free granola now ! 1/4-1/3 cup Maple Flavored Sugar-Free Syrup - optional, adjust regarding taste, read note for options ! Preheat oven to (150C) 300F . Line a baking tray with parchment paper. Set aside. Toss into a large mixing bowl coconut flakes, chopped cashews, chopped walnuts, chopped almonds, sunflower seeds, pumpkin seeds, chia seeds, flaxseed meal, sliced almonds, ground cinnamon and salt. In a sauce pan, under medium heat, melt the coconut oil with vanilla and sweetener if used! Optional, read notes. Stir occasionally until the coconut oil is melted. honey - less than 1 minute. Pour over the grain free granola mixture. Use a spatula to stir and combine. 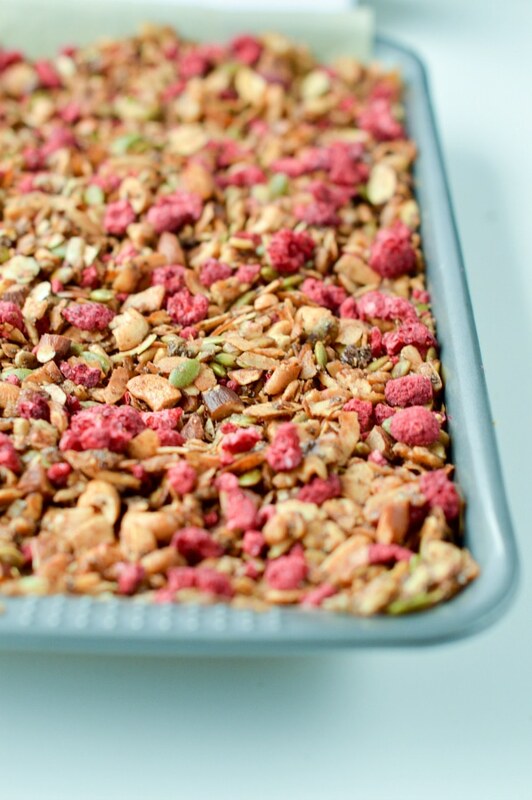 Spread your grain free granola mixture evenly on the prepared baking tray. Make sure you spread the granola in a single thin layer or use two baking tray if needed. Cool down for 15 minutes on the tray then stir in the dried freeze raspberries. 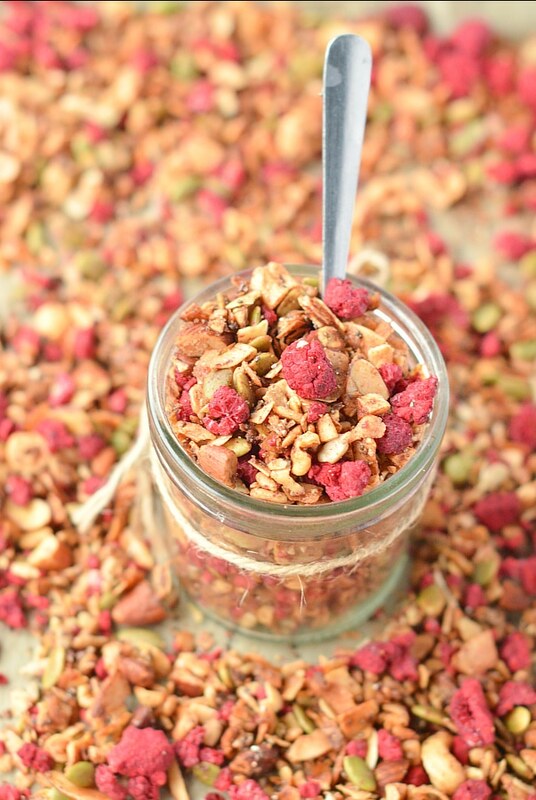 Transfer your cool granola into a glass preserving jar. 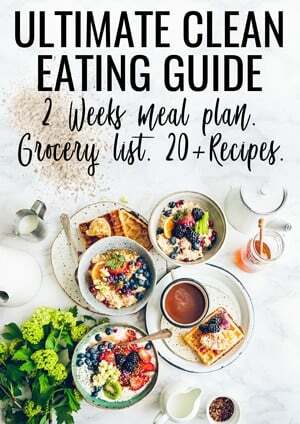 Store up to 2 weeks. this recipe makes roughly 5 cups of granola. Serving size 1/4 cup. Serve as a breakfast 'cereal', serving size suggestion is 1/4 cup of grain free granola with 1/2 cup unsweetened almond milk. This recipe works without adding any sweetener. No need to add more oil. Roast the grain free granola like this. It is the perfect option for breakfast 'grain free cereal' bowl. Then, simply serve your grain free granola with nut milk and sweetened your breakfast bowl with natural sugar free sweetener like stevia or swerve. This coat the grain free granola perfectly, perfect to add natural sugar free sweetness and use granola either in desert like parfait or breakfast bowl. I usually prefer this option if I am using my sugar free granola with milk. I like this option less if I eat my granola as a snack as the erythritol won't spread as evenly as liquid sweetener above and leave bites of sweetener into the mix. However, I love this option for my breakfast as the sweetener release its sweetness really well into the milk. Freeze dried raspberry replacement: that is your best sugar free fruit but if you can eat some sweet use any dried fruits of your choice like gojo berries, cranberries or apricots. Not sugar free? Use regular maple syrup instead of sugar free sweetener, same amount and use any dried fruits you like instead of freeze dried raspberries. Nutrition panel is for 1/4 cup of grain free sugar free granola using Natural Maple-flavored sugar free syrup. Hello! I am not sure you realize how much happiness you just send into my face 🙂 5 years ago I started this blog as I was also instructed to go on low carb/sugar free diet (prediabetes for my case). I had no idea that my recipes will help others but it makes me SO happy to read it actually does! I know how frustrating it could be to crave sweet and be left out on family dinner. That’s why there is so many sugar free dessert on my blog. Enjoy them and thanks for trying them out. Love from NZ, Carine. 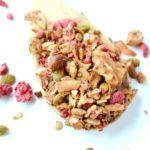 Love the way you work flakes and fruit into this gluten free keto friendly granola! Bookmarked for my next batch! Easy to know this will be five stars! Merci! Thank you ! Enjoy the lovely granola. A bientot, Carine. Would I be able to use vanilla essence for this recipe ? This is so good!!!! I only used the nuts I had at the time. I think I added double the cinnamon. You can really roughly follow the recipe and it’s still delicious! Thank you so much for this lovely comment! So glad you love it too. XOXO Carine. Hi Carine, thank you for a wonderful recipe! I just made it now and I found that even after baking, it’s still a bit ‘wet’. Any ideas on what I could do to make it more clustery? I am not vegan, just following a keto diet, so I don’t mind eggs or anything else non-vegan you might suggest. Many thanks! I am glad you love it. You can add an egg white to the mixture to make clusters if it is the texture you prefer. Enjoy the recipe. XOXO Carine.